In the future, we’re all going to be Spiderman. At least, those of us who can afford super-sticky light-controlled wall-climbing spider boots. A team of German scientists created a strong adhesive that can quickly stick and unstick with just a flash of light. The new device could have applications in industry, building precise microelectronics without leaving a goopy residue. Or it could one day turn a human into a spider-person. “The global aim is to make an adhesive to climb surfaces for humans,” Emre Kizilkan, lead study author from the Zoological Institute at Kiel University in Germany told Gizmodo. The device incorporates a gecko foot-inspired tape atop a porous, light-sensitive film—the key advance of the research. 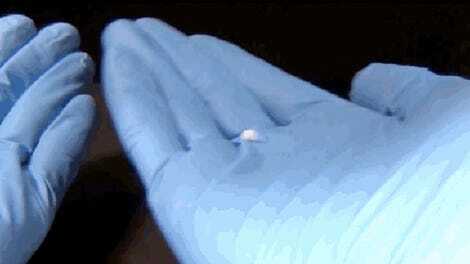 The film consists of azobenzene, a molecule that curls up under ultraviolet light. The adhesive surface contains thousands of 70-micrometer tall mushroom-shaped pillars that accomplish the sticking via van der Waals forces. Those innate forces occur because electrons aren’t evenly distributed on some atoms, so charge naturally accumulates on the tops, causing them to cling to whatever thing the adhesive is sticking to. Put it together, and the scientists can control how many of the tiny towers touch the surface by turning the UV on and off. Essentially, the researchers have created a UV controlled candy claw, but with a microstructured sticker instead of a claw. The UV light causes the device to curl, which affects the amount of sticky surface area touching whatever the researchers want to pick up. The scientists used this property in two different ways: first, they picked up 2D surfaces like glass plates with the light turned off. Next, they turned the light on, and used the curled tape to pick up spheres. Those spheres could then be released by turning the light off again, and flattening the adhesive out. This would be especially useful “in a clean room environment,” said Kizilkan. “For example, transportation of silicon wafers.” The researchers published their results today in Science Robotics. Kizilkan’s demonstration impressed Ware. “The nice features of this work are the fact that it’s fast, reversible, [it] returns to adhesion quite fast, and it’s light responsive,” he said. He agreed that the device would be most useful transporting tiny objects in a manufacturing environment. Kizilkan ultimately wants to use these surfaces alongside robotics to create an adhesive for wall climbing, since it’s super sticky—a 20 centimeter square of the stuff is strong enough to pick up a human adult male, he said, though they didn’t test it on people. Ware was cautious to go that far. “There are still a number of concerns with the durability of that material... over many cycles,” he said. “And when they become dirty in some way, it can limit their utility.” Kizilkan pointed out that becoming dirty wouldn’t change the material itself, just clog it up. Hopefully, the scientists can get some spider boots built soon, since I know there are plenty of spiderguys just waiting to start scaling their favorite skyscrapers.